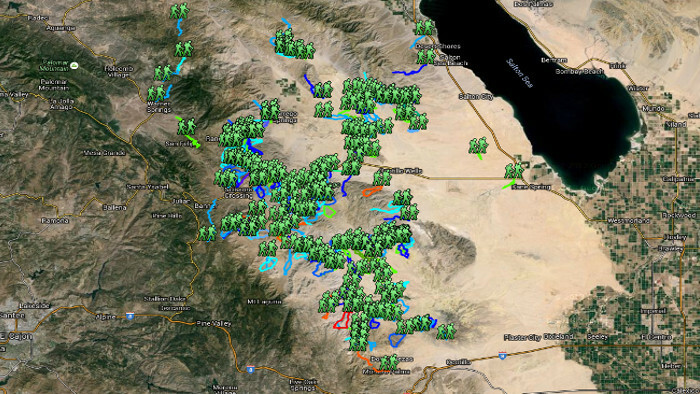 This map shows all hikes in the and around the Anza Borrego Desert. Coyote canyon north of Borrego Springs. Alcoholic Pass, Alder Canyon, Ash Wash, Bennis Bowl, Box Canyon, Cougar Canyon, Collins Valley, Coyote Creek, First Crossing, Galletta Meadows, Henderson Canyon, Horse Camp, Horse Canyon, Indian Canyon, Lower Willows, Middle Willows, Ocotillo Flat, Salvador Canyon, Second Crossing, Sheep Canyon, Third Crossing, Turkey Track, White wash.
Clark valley north/east of Borrego Springs. Butler Canyon, Clark Dry Lake, Coyote Mountain, Little Clark Dry Lake, Lute Fault Scarp, Rockhouse Canyon, Jackass Flat. North of Hwy S22, east of Borrego Springs. Follow the S22 East, Borrego Salton Seaway. Hikes are north of the road. Arroyo Salado, Calcite Mine, Coachwhip Wash, Ella Wash, Grave Wash, Joshua Canyon, North Palm Wash, Palm Peak, Palm Wash, Palo Verde Wash, Pyramid Peak, Rattlesnake Canyon, Smoketree Canyon, Traveler Peak, Travertine Palms, Truckhaven Rocks, Villager Peak, Wonderstone Wash. Between the S22 East, Borrego Salton Seaway. 1 Palm, 5 Palms, 17 Palms, Ant hill, Arroyo salado, Artesian well, Big wash, Blow sand canyon, Borrego Badlands, Borrego Mountains, Fault wash, Fonts point, Gas Domes, Hawk canyon, Hills of the moon, Inspiration point, Malpais, Pumpkin patch, Rainbow wash, Slot canyon, San Felipe creek, San Sebastian marsh, Short wash, Tarantula wash, The Slot, Third wash, Thimble trail, West butte. South of the Christmas Circle in Borrego Springs. South and West of the S3. The S3 leads up to the Yaqui Pass. Glorietta canyon, Yaqui Meadows, Yaqui Ridge. Winding up the Montezuma Hwy up to Ranchita and further. Barrel spring, Big Spring, Bubbling Springs, California Riding and Hiking, Chief Rain In The Face, Chimney Rock, Culp Valley, Dry Canyon, Eagle Rock, Flat Cat Canyon, Hellhole Canyon, Indian Head, Jasper Trail, Little Surprise Canyon, Middle Spring, Palm Canyon, Pena Spring, Pinyon Spring, The Slab, Thimble Peak, Tubb Canyon, Wilson Trail, Wilson Mountain and Ysidrio Peak. South west of Borrego springs. Between Grapevine Canyon towards the San Felipe hills and including the San Felipe Wildlife area. Angelina Spring, Barrel Spring, Bitter Creek, California Riding and Hiking, Grapevine Peak, Pacific Crest Trail, San Felipe Hills, San Felipe Wildlife area. Alma wash, Bighorn canyon, Chuckwalla wash, Harper canyon, Kenyon cove, Kumeyaay village, Lizard wash, Mine wash, Narrows earth, Nolina canyon, Perpendicular bluff, Pinyon canyon/wash, Plum canyon, Quarz vein wash, Sentenac canyon, Sunset wash.
South of Ocotillo Wells, take the Split Mountain Rd. Blackwood Basin, Cairn Wash, Camels Head Wash, Coral Wash, Dave Mc Cain Spring, Dieguenos Wash, Diablo Drop-off, Elephant Knees, Fish Creek Mountain, Jigsaw Wash, Layer Cake Wash, Loop Wash, Lycium Wash, Mud Palisades, No Return canyon, Oyster Shell Wash, Pirate Wash, Sandstone Canyon, Wind Caves, Gypsum Peak. South of scissors crossing along the S2 and from Julian along the S1. Including the Vallecito County Park. Banner, Blair Valley, Box Canyon, Chariot Mountain, Cool Canyon, Cottonwood Canyon, Fages, Felden deposit, Ghost Mountain, Golden Queen Mine, Granite mountain, Green Valley, Hawi Vallecito, Hornblende Canyon, Kwaaymi Point, La Cima, Oriflamme Canyon, Pinyon Mine Wash, Rainbow Canyon, Rodriguez Canyon, Salt Creek, Smuggler Canyon, Soapstone, Storm Canyon, The Potrero and Whale peak. South of the Vallecito County Park. Up to the Carrizo Creek. 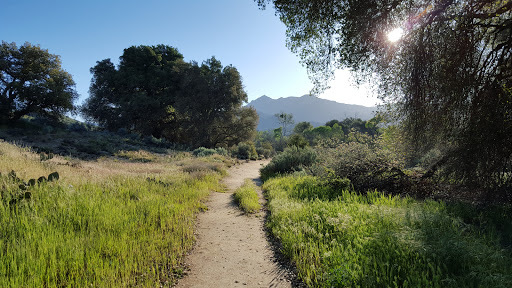 Agua Caliente, Arroyo Hueso, Arroyo Seco del Diablo, Bisnaga Alta, Bisnaga Wash, Bow Willow, Diablo Canyon, Dieguenos Wash, Garnet Peak, Gert Wash, Indian Valley, Inner Pastures, June Wash, Tapiado Seco Del Diablo, Marsh Canyon, Moonlight Canyon, Mud Caves, Mountain Palm Springs, North Wash, Palm Spring, Rockhouse Canyon, Smuggler Canyon, Sombrero Peak, Squaw Canyon, Torote Canyon, Vallecito Canyon, View of the Badlands Wash.
South of the Carrizo Creek. Up to Sweeny Pass and Ocotillo. Andrade Canyon, Carrizo Creek, Dolomite Nine, Domelands, Fossil Canyon, Gert Wash, Goat Canyon, Jim Canyon, Jojoba Wash, Jucumba Canyon, Mortero Palms, Rockhouse Canyon, Sin Nombre, Sweeney Pass, Trestle, Volcanic Hills, Wind Caves. North west part of the park. This area is in or just outside the park boundary. It's covered with denser vegetation, so hiking is mostly limited to established trails. 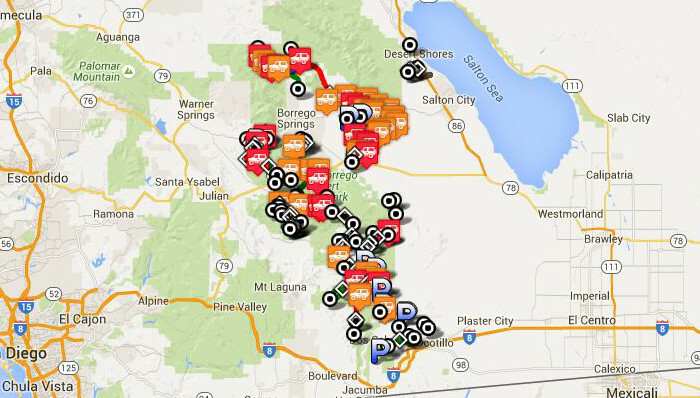 Combs Peak, Eagle Rock, Lost Valley, Pacific Crest Trail, Thule Canyon, Warner Springs. This map shows all dirt roads in the and around the Anza Borrego Desert.